MSC Meraviglia has completed its second round of Sea Trials while in the final fitting out phase. The first ship in its class is one step closer to completion after finishing the second round of Sea Trials. 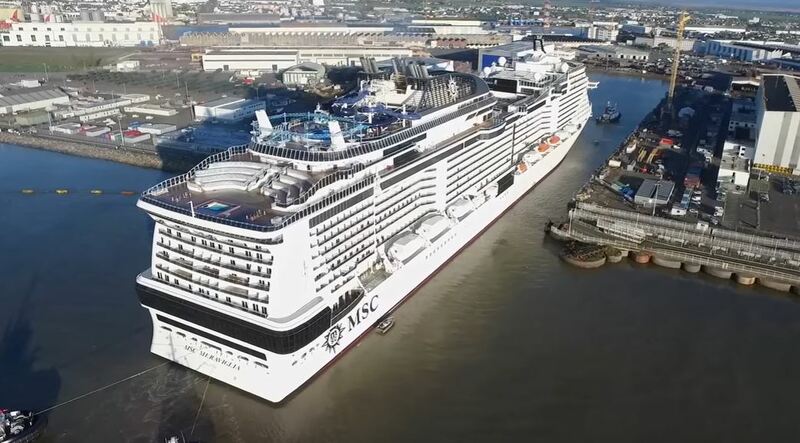 MSC Meraviglia is currently in the final fitting out phase at the STX shipyard in France and the Sea Trials are one of the last major milestones before being delivered to the cruise line. The second round of sea trials was completed on Sunday and many aspects of the ship were tested while at sea. When the ship was just off the French coast several technical aspects were looked at including the ship’s propulsion systems and at sea procedures. Many of the tests can only be done at sea to make sure the MSC Maraviglia is seaworthy and ready for its maiden voyage. MSC Meraviglia is 167,600 gross tons and the largest ship being built for the cruise line to date. There are even larger vessels in order for the cruise line, there are so many that we would have to dedicate an entire post to them! MSC Meraviglia will debut on June 1 and spend its inaugural season sailing in the Meditteranean.